There’s a certain hypocritical elitism found in many basic travellers where one shuns the easy options of package tours, expensive hotels, guides and airport transfers. We all know the type, the type we find ourselves somewhat similar to but desperately attempt to steer clear of jealous spite. Welcome to the dilemma we find ourselves in upon arriving in Luang Prabang; a good friend of ours, Sparky, is some kind of big cheese with a hotel group and basically he’s a legend. Yada yada long story, we opt for a few nights in Kiridara, basically the definition of posh resort spa we often find ourselves steering clear of not for lack of means necessarily but in favour of the rougher side of travel. Yes we often tut-tut at the resort set we are about to become, oh the shame, it’s like coming out all over again! After two months camping in Africa, hiking in Nepal with that earthquake thingy and then gaining massive hostel common room credibility cycling in China we’re in need of recovery more than we want to admit, we can’t refuse the offer we might otherwise shy away from. Anyway, enough justifying it to myself, we catch a tuk-tuk to Kiridara to check in not sure of what we will find. After over eight months of racking up shoestring traveller notoriety it feels a little weird to be in the midst of such luxury, through the reception we wind our way up some stairs and past the infinity pool, of course there’s an infinity pool to our luscious apartment. I can’t call it a room, it’s bigger than most studios in Sydney. As the heavy timber door clicks closed behind us we fall into the continent of soft sheets that is our bed; I call out to Charlie lost somewhere in this huge salt flat of downy lusciousness we’re calling a bed. There is guilt in staying somewhere this nice, we feel a little dirty. Weirdly enough we sit at the pool, such a cliche, overlooking the ornate rooftops of historical Luang Prabang and we don’t feel the oppressive tacky gentrification that often resides in this category of place. Shiny tiles, timber veneer and chrome plated aluminium are nowhere to be found; in the place of that style of bleach drowned torpor we find timber, raw concrete, stone and an elegant garden crawling over a place that feels nothing like a horrible safety bubble for the fearful. Paper lamps hang from frangipanis, a patina of crawling vines rounds the harsh corners and orchids clinging to trees bow out to welcome us. Yes this is a posh place but far from swimming in the over sterilised filth of new money this place manages an elegant tightrope between sophisticated and comfortable. Maybe its our desperate need to rest that we barely acknowledge or maybe it’s a design triumph but we spend our first morning doing absolutely nothing. I think we needed the rest. And of course there is the hour and a half spa-massage. We had makeover day in Pokhara after making it out of the Annapurna circuit but we’re kicking up the gears here. Of course we have our feet washed and scrubbed before selecting just the right fragrance of oil for our massage, lemongrass for me, jasmine for Charlie naturally. Is it bad to fall asleep and drool through the face hole of your massage bed? Having some massage training I can tell a good massage and these girls are true professionals, my stamp of approval in an incriminating spot of drool I pray no one notices. Of course we sit in our slippers and sip a tea afterwards; I mean, duh! This luxury is all too exhausting, we need a nap to wake up, there is such a thing as luxury guilt after all and we have it by the spacious granite bath tub load; yes we have one of those here too. From this morning to now we can barely recognise ourselves so nearly back to our old selves we hop on some bikes and head into town, Luang Prabang is offensively beautiful and we’ve barely seen it. Our bikes aren’t the tuned machines of our Chinese voyage, no hope of settling into good cycling form here but the 80’s style ladies bikes make up for any technical proficiency with pure awesomeness, I wish we did the Yunann trip on these babies. There’s even a bell and I’m not afraid to use it, ding ding! Exhausted, must book into another massage later, this 10 minute ride is just too much so we must have a beer on an open air deck over the Mekong. 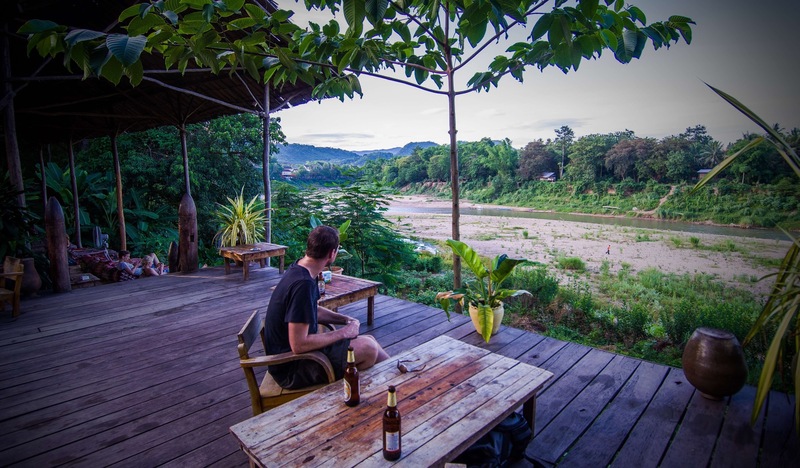 What a perfect setting, again Luang Prabang delivers rustic cool without any of the hippie wannabe skank to make the perfect setting for us to dissect our recent travels and trials. We take a moment to solve the worlds problems but it’s food time and of course we have some luxury guilt to mitigate so it’s night market time. Loading up our bowls at the crammed open air buffet the world whizzes by in a chorus of colour, noise and movement. A thin little wooden plank bench supports us as we scoff down our mixed bowl of noodles, vegetables and whatever else looks good that I don’t recognise. Layers and layers of old rusty corrugated iron form our roof a few inches lower than head height as vendor after vendor offers up a delectable array of grilled whatever it is; heaven. We’ve barely skirted Luang Prabang yet unavoidably it bursts with an old world charm, French colonial architecture lines nearly every street barely shrouded by explosive tropical gardens. This place is european history loaded with bustling Asian street life, no wonder it’s a UNESCO world heritage site. 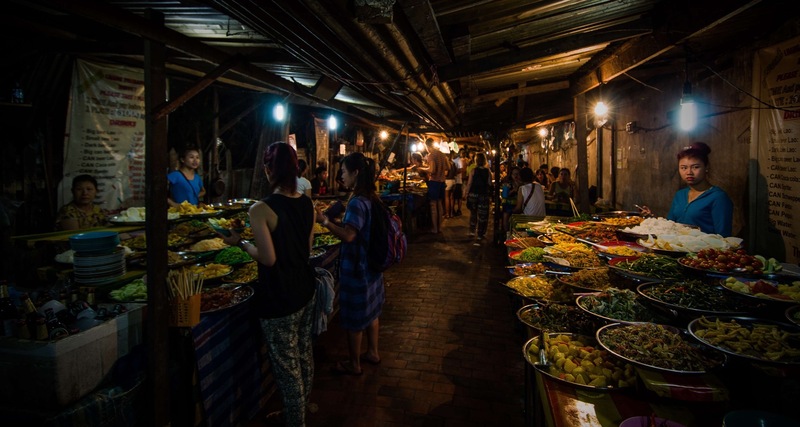 Some places are tourist hot spots because they’re easy options for those unwilling to give a new thing a try and some are like Luang Prabang, just unavoidably desirable to see and be part of. For now though it’s back to luxury guilt like junkies that know it’s not good for us but we want more and more anyway. Floating in the pool gazing up at the stars I smirk recalling the famous quote from Marie Antoinette, ‘let them eat cake’. The first take on this famous line is that when people were starving she suggested to eat cake which is more expensive showing a huge disregard for the common struggle. Another take is that it was a desperate plead for clemency as she was taken to the guillotine, a penance to the peasants. While she probably never said it at all it’s a famous quote so elegantly exemplifying those in the aristocracy looking down on the poor. 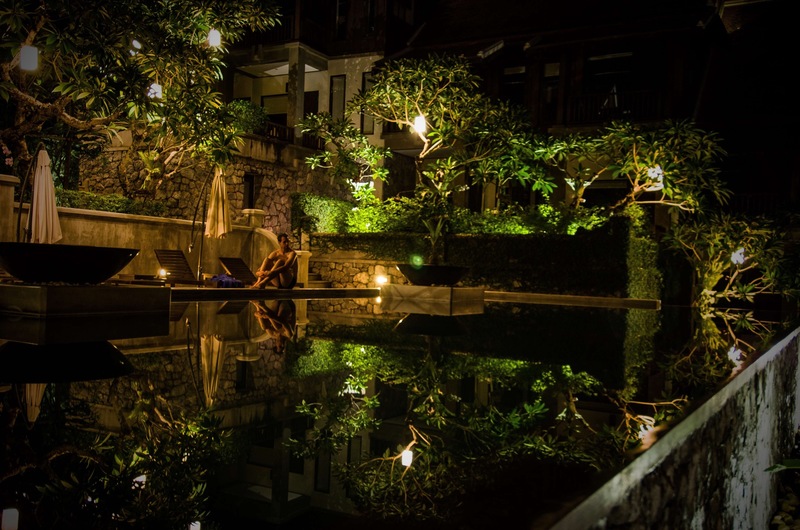 The gentle splashes of water over the swimming pool lap to the rhythm of my arms and lamps illuminate the trees above me as I wonder what the poor people are doing tonight. Luxury guilt temporarily ebbs with the water to infinity, I hope they’re eating cake.